As the worldwide death toll from tobacco use continues to climb—it's currently six million per year and is expected to top eight million by 2030, according to the World Health Organization—efforts to unlock the secrets of nicotine addiction take on a distinct urgency. "Nicotine is one of the most difficult drugs to quit," says Ines Ibanez-Tallon, a scientists in the lab of Nathaniel Heintz, who is James and Marilyn Simons Professor at the Rockefeller University. For sure, while 70 percent of cigarette smokers in the U.S. say they would like to quit, each year only 3 percent are able to do so successfully. Now, in her latest paper, Ibanez-Tallon and colleagues from Rockefeller, Mount Sinai Medical School, and the National Institute of Biological Sciences, China, move us one step closer to understanding how nicotine maintains its powerful grip on the brain. The research, published this week in the Proceedings of the National Academy of Science, identifies specific chemical changes deep in the brain that help drive nicotine addiction. It also describes experiments in which the scientists were able to halt these changes in mice and discover potential targets for drugs to treat tobacco dependence. Nicotine is a stimulant that works by binding to receptors widely distributed throughout the brain, causing neurons to release a variety of neurotransmitters including dopamine, which triggers feelings of pleasure. In a search for the brain cells that transmit this response, Ibanez-Tallon's group investigated how nicotine affects two midbrain structures, the interpeduncular nucleus (IPN) and the medial habenula (MHb). While these brain regions are ancient in evolutionary terms and are found in all vertebrates, including humans, they have not received much attention from scientists until recently, Ibanez-Tallon says. Working with mice, Jessica L. Ables, first author of the study, found that chronic nicotine consumption alters the functions of a particular population of neurons inside the IPN. These altered brain cells, which she dubbed Amigo1, appear to promote nicotine addiction by disrupting the communication between the habenula and the IPN. Normally, these brain structures have a system in place to curtail nicotine addiction. The habenula responds to a given dose of nicotine by sending an aversion signal to the IPN that decreases the reward of the drug, an effect that ultimately limits the urge to consume nicotine. After chronic exposure to nicotine, however—the mice used in the study drank nicotine-laced water for six weeks—the Amigo1 cells compromise this "braking effect" by releasing two chemicals that reduce the response of the IPN to the aversion signal from the habenula. In other words, the stop-smoking message doesn't get delivered. The result is a "pro-addiction" response to nicotine, which the mice displayed in a behavioral test designed to measure the motivational properties of the drug. In the test, called conditioned place preference, the mice chose to spend time in a chamber where they had previously received nicotine. "If you are exposed to nicotine over a long period you produce more of the signal-disrupting chemicals and this desensitizes you," says Ibanez-Tallon. "That's why smokers keep smoking." In other experiments, her group was able to confirm that these mice's response to chronic nicotine was indeed influenced by Amigo1 neurons. 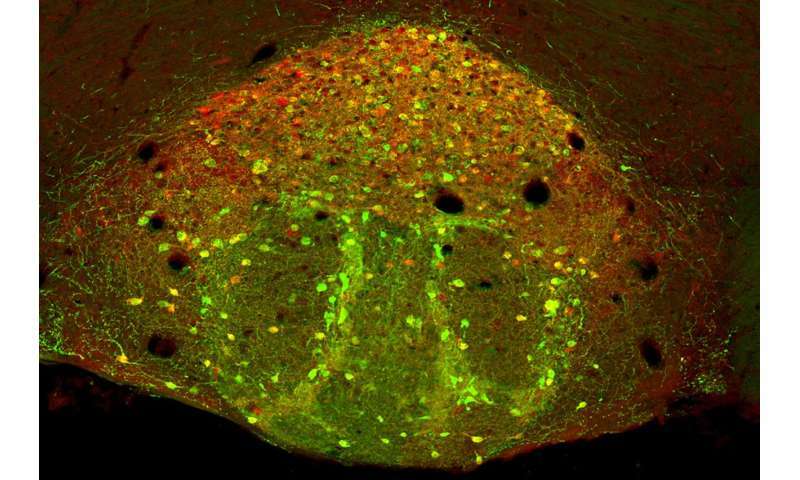 When the researchers silenced these neurons using a genetic engineering technique, this eliminated the "nicotine preference" of the mice, strongly suggesting that those neurons play a role in the addictive behavior. An additional experiment that left Amigo1 alone but blocked the production of nitric oxide (NO), one of the two addiction-driving chemicals over-expressed by the neurons, gave similar results. "What all of this tells us is that the habenula-IPN pathway is important for smoking in humans," says Ibanez-Tallon, who plans to further investigate the Amigo1 brain cells and the chemical changes they trigger, with the ultimate goal of developing new drugs. "When it comes to a massive health problem like nicotine addiction," she adds, "any therapeutic target we can find is potentially significant."